Apnea is defined as the cessation of breathing. Obstructive sleep apnea is a condition in which the soft tissues of the oral cavity collapse onto the back of the throat completely closing off the airway so that air cannot flow into the lungs. The harder one tries to breathe, the tighter the airway seals. This airway blockage reduces the amount of oxygen reaching the brain and body. When the oxygen level drops low enough, the brain moves out of deep sleep alerting the muscles in the airway to tighten up and unblock the airway. You partially awaken the airway contracts and opens, clearing the obstruction. Air rushes in usually with a loud gasp or snort. You begin breathing and many times snoring again. You then move back into a deeper sleep, the airway muscles collapse and the process begins all over again. This scenario can occur many times during the night. 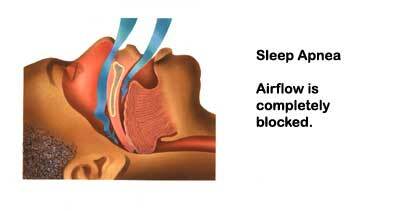 The blocking and unblocking of the airway cause significant disruption of restful sleep. The combination of low oxygen levels and fragmented sleep are the major factors difficulty staying that contribute to the problems sleep apnea sufferers’ experience. They usually complain of daytime sleepiness difficulty staying awake during meetings or conversations, or while reading, watching television, or driving. Daytime sleepiness can also impair the ability to concentrate, both at work and at home. Sleep Apnea is a health problem that can be life threatening. It is important to see a sleep disorder specialist if you are experiencing snoring and daytime sleepiness.